How to Get Rid of Scorpions Naturally — . Scorpions in The Home, Scorpions in Your Yard, Is There a Natural Scorpion Treatment? If you are seeking a highly effective, natural scorpion control solution, you’ve come to the right place. Most customers we speak with agree, scorpions are scary. There’s nothing like a scorpion sighting in your home to ratchet up the tension level to a category 5. These 6 legged armored invaders with their ominous pincers and a poison stinger claw on the end of its arched tail seem more like aliens from another dimension. For thousands of years, mankind has made every effort to get rid of scorpions and avoid them altogether. From the Arachnida family, scorpions are closely related to spiders, mites and ticks. Since the average lifespan of a scorpion range from 3 to 5 years and a mother produces an average of 30 living young per brood, you really need to make haste to get the scorpions under control sooner rather than later. Worldwide there are some 2000 different species of these poisonous predators. There are approximately 90 species of scorpions found in the United States. Scorpions are survivors and have adapted to a wide range of habitats, from savannas to rain forests and even caves, however they are most abundantly found in more arid climates. The vast majority of our customers that are seeking a non-toxic, natural scorpion control product contact us from Arizona, California, New Mexico and Texas. For as much as folks love the climate and enchantment of living in the high desert, having a scorpion problem can be a real killjoy. Scorpions are nocturnal and spend all day in hiding under a rock or logs or in crack in the concrete. Some species will dig and hide in burrows. At night these nocturnal hunters emerge hungry for spiders, insects and other small invertebrates but their diet can be extremely variable. Amazingly, when they encounter extreme food shortage, they can put themselves in a semi-suspended animation state, slowing down their metabolism by two thirds. This survival tool allows some species of scorpions to survive eating just a few flies per year. While daytime temperatures soar, scorpions seek out a cool, dark hide out, like a rock or woodpile or beneath the bark of some trees. Although scorpions are most famously found in the high deserts of the southwest, the human sprawl continues to push us ever closer to their natural home in the mountains, mesas and buttes; we are displacing them out of their normal environment. This is a big reason we hear so often from homeowners adjacent to a new construction site, the build out has displaced the scorpions, so naturally, they want to come over to your place. Scorpions know that ditches, canals and steams will attract their prey; therefore they are attracted into these new urban areas to hunt near such water sources. Start with a common sense clean up of your yard, loose lumber lying around, piles of rocks and debris, especially near foundation walls, should be thoroughly examined for scorpion invaders and removed from around your living space. Remove any rubbish from your lot that might attract scorpions and keep your lawn and landscaping short and trimmed make sure that there are no branches overhanging above your house. If you have a woodpile for your fireplace, make sure it is several yards away from your home. Although, this may be inconvenient, it is necessary step to take if you wish to get rid of the scorpion population near and around your property. Prevent scorpions from coming inside by sealing off all cracks and holes in interior and exterior walls. If a scorpion can get through it, you need to seal it closed with silicone caulking or masonry patch materials. Caulk up any cracks you may have in your foundation or siding so the scorpions cannot enter your home. Lots of customers have had success with expanding foam products. Finally, make sure your screens do not have any holes in them so the scorpions cannot enter through an open window. Scorpions too breathe through tiny spherical tubes in their body, one whiff of Best Ever will immediately get rid of scorpions in your home and leave behind a residual barrier guarding against re-entry. BEST EVER instantly roots out and drives away any hidden scorpion invaders from your living space, yet it is completely non-toxic to children and pets. 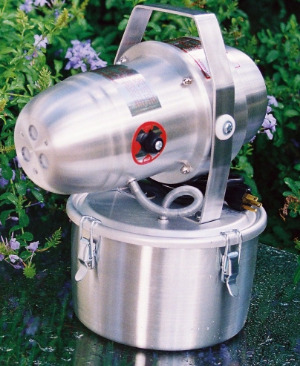 You can spray BEST EVER manually or if you have a larger infestation wherein the scorpions are harboring in walls and all the cracks and crevices of your home we highly recommend applying BEST EVER via the ACT Tri-Jet Fogger machine in a fumigation agenda. Fogging your home and attic with BEST EVER will reach all the unseen pests that manual spraying can miss. Please know that the attic is a hot spot for scorpions and a key entry point for them to come into your home, so don’t forget to treat the attic and be thorough. After you get rid of scorpions from the house, it is time to focus your efforts on your yard and grounds. All pests come from the outside, thus by treating your yard you will create a scorpion deterrent zone in your outdoor living and working space, further protecting the inside of your home with an additional exterior layer of scorpion protection. Pest Control Outdoors (PCO) is especially designed as an all natural scorpion pesticide for exterior use. The PCO formulation uses the same cedar oil technology to get rid of scorpions we use in BEST EVER, however the carrier in PCO concentrate is a much larger molecule and works exceptionally well with lots of water. Pour 4 to 6 ounces of Pest Control Outdoors into a 20-gallon hose-end sprayer receptacle, then top off with water. Attach to a garden hose and starting at the foundation, soak everything including exterior walls, eaves and entry points, be sure you thoroughly soak everything from the foundation to the fence line. This application will eliminate the threat of scorpions returning to your place. Since PCO is an organic scorpion pesticide, homeowners can treat without any worry of contaminating your living area with dangerous nerve-toxic poisons. Because all of our get rid of scorpion products are naturally derived and non-toxic, it is impossible to over treat. That fact instills a high level of confidence in our customers, knowing they can get rid of scorpions naturally without harming themselves, children, pets or the environment in the process. At the end of the procedure you will be scorpion free, not to mention that this protocol will completely remove a host of other unwanted flying and biting insect pest from your yard. Despite what claims you may hear from your local pest control guy, the chemical scorpion killer treatments they offer are dangerous and toxic to humans, especially little ones. Using synthetic chemicals is an ineffective and feckless approach to solving your scorpion problems. Scorpions are hard to kill with a hammer. When you treat with BEST EVER, a natural scorpion pesticide, you can expect it to kill adolescents only, adults will be instantly repelled. Unlike synthetic pesticides that attack the pest via it’s nervous system. We attack the pest via its breathing system. For centuries the powerful pest repelling properties of cedar have been known and treasured as a natural and effective pest and scorpion deterrent. We offer high quality granules made from red cedar heartwood, granules made from the center of choice and aged red cedar trees common only to East Central Texas. These granules contain high concentrates of aromatic red cedar oil, which is extremely offensive to scorpions and insects in general. The long lasting aroma will repel scorpions, rats and snakes from your sacred area, yet has no effect on beneficial insects such as butterflies and pollinating bees. Liberally sprinkle cedar granules in areas you wish to keep off limits to scorpions and other unwanted pests. Lay down a 6-10 inch swath of cedar granules around the perimeter of the yard, along the fence line, around the foundation, near entry areas of your home. Distribute and spread granules as a natural scorpion barrier. You’ll enjoy the pleasant aroma of cedar, scorpions won’t. This is a very low cost and effective method to create a natural barrier against scorpion encroachment. Scorpions, non-beneficial insects and venomous snakes instinctively react to pheromone (smell) and heat stimuli. To these undesirables the smell of cedar oil is unbearable agony. Our cedar oil active ingredient formula interferes with their octopamine neuroreceptors and impairs an insect's instinctual ability to detect food, mate, and reproduce. When insects' comfort levels are disturbed, they become disoriented and overwhelmed. To escape the discomfort, they relocate or die. Regular, continued use of this product will create a barrier of re-entry to treated areas, resulting in a scorpion and insect-free environment. What the aroma of cedar does to scorpions could be compared to what the smell of ammonia does to humans. Insects can easily be overcome, with death as the final result. The aroma fumes from cedar rise upward into the air. Remember, if you can smell it six feet off the ground, so can the scorpions. That's why it creates an invisible barrier that keeps scorpions where you want them, away from you! Only a handful of scorpion species has strong enough venom to kill a person, take the bark scorpion, a very venomous and lethal scorpion found in abundance in and around Phoenix, it has been responsible for many deaths. Even though the vast majority of scorpion bites aren’t fatal, to humans, make no mistake, a scorpion bites hurt. “It’s worse than a double wasp sting”, one 14 year old boy from St George, Utah reported after an encounter with several striped tail scorpions under his porch. Of course the scorpion sting is most dangerous to children, the elderly and anyone allergic to the venom. There are few things more frightening to parents than the thought of seeing their children bitten between the toes by a scorpion on a late night trip to the bathroom or getting stung as they play in your own back yard. It’s nerve racking to say the least. On top of that, most products available for scorpion extermination are harsh, nerve-toxic poisons, the last thing parents want their children and pets exposed to. There is absolutely no reason to worry about these pests or the nasty scorpion poison sold at the hardware store, you can solve your problem quickly with our natural scorpion prevention kits.